We reported a fully integrated impulse radiator with the capability of radiating impulses with 4ps FWHM and reconfigurable amplitude. The peak radiated power at 54GHz is 8.7dBm with a 13.6dBm peak EIRP. 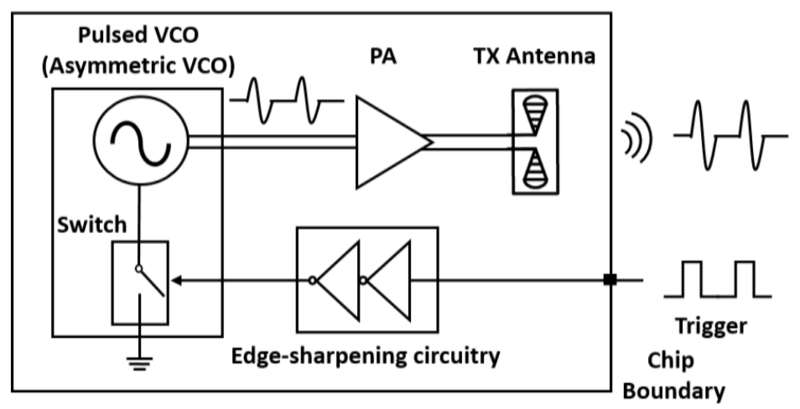 A Non-Linear Q-Switching Impedance (NLQSI) technique is introduced to generate impulses and control their amplitudes. 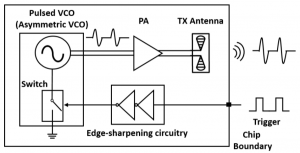 Furthermore, a two-bit impulse amplitude modulation is achieved through an onchip fourway impulse combiner, which also attenuates parasitic induced low-frequency radiation. In addition to performing frequency- domain measurements, for the first time, an ultra-wideband THz Time-Domain Spectroscopy (THz-TDS) system is utilized to characterize the radiated signal in time-domain. The radiated impulse has an SNR>1 bandwidth of more than 160GHz. The fully-integrated impulse radiator is implemented in a 0.13μm SiGe BiCMOS process. It has a die area of 1mm2 and it consumes 170mW. P. Chen and A. Babakhani, “3D Radar Imaging based on a Synthetic Array of 30GHz Impulse Radiators with On-Chip Antennas in 130nm SiGe BiCMOS,” submitted to IEEE Transactions on Microwave Theory and Techniques, 2016.